One of the items left behind after my husband's departure was his slow cooker. I'd been anxiously waiting for cooler weather to try using it (because those things actually put out a lot of heat when running all day). It seemed like such a good idea. Throw stuff in while my son is napping and then have dinner all ready without any fuss or muss. Or toddler wrangling. Put all ingredients in the crock pot, chunking out the cream cheese. Cook on low for 5-6 hours. 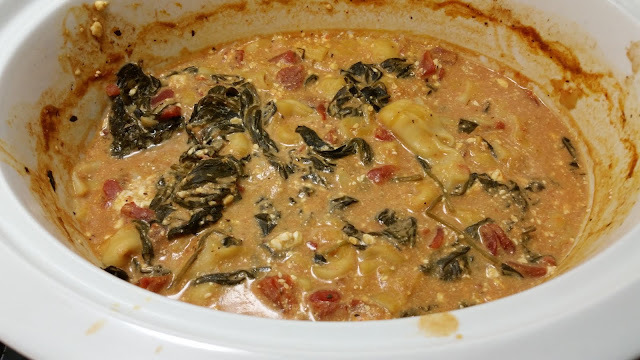 The results: the tortellini was beyond soggy, to the point of disintegration. The overall flavor was bland. It needed something. Spices? Onion? Garlic? Even corn might've helped. The spinach was the best part, otherwise it was just bland mush. If I ever did this again (and I won't), I would exclude the cream cheese. It was weird and lumpy and added nothing to the whole affair. I split the leftovers and froze two thirds of it. Maybe when my electric bill is sky high this winter and I'm feeling desperately broke, I will be grateful for the sustenance. sorry it didn't work out! Some crockpot items are quite good. Did you have it on the lowest setting? I'd experiment with it for you, but it's not something I could eat. I used to use the crockpot a lot, but I use it a lot less now. There are some occasions I like it. Winter Picnics, covered dish dinners. Great for keeping Jambalaya warm at a party, like the one I am attending tonight. For the Jambalaya, I cook it in a frying pan and then put it in the crockpot, prewarmed, to keep warm at the party. It's a writer's party, covered dish. Most people nowadays bring something they've purchased, but I am still making homemade food, for my health.